ʻOhe makai belongs to the Ginseng family (Araliaceae), which also includes other native trees such as ʻōlapa (Cheirodendron spp. ), munroidendron or pōkalakala, and ʻohe mauka. The non-native and invasive octopus tree or heʻe (Schefflera actinophylla) is also in this same family. The former generic name Reynoldsia is named on behalf of J. N. Reynolds, an early 19th century plant collector and promoter of the South Sea Exploring Expedition.The new generic name Polyscias is from the Greek word “many-shades” in reference to the foliage. The species name sandwicensis refers to the “Sandwich Islands,” as the Hawaiian Islands were once called, and named by James Cook on one of his voyages in the 1770’s. James Cook named the islands after John Montagu (The fourth Earl of Sandwich) for supporting Cook’s voyages. ʻOheʻohe is a Niʻihau name for this plant. 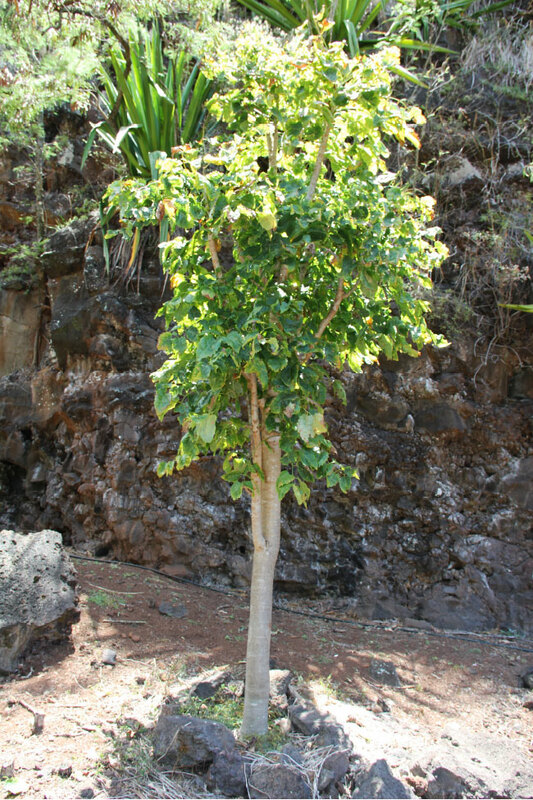 ʻOhe makai is one of the few native Hawaiian trees that are deciduous, dropping all leaves during the summer month dormancy, or at other dry times of the year. This species is becoming rare in its natural habitat. Boys and girls, as well as men, in old Hawaiʻi nei enjoyed walking on stilts called kukuluaeʻo, or simply aeʻo, named after the long-legged Hawaiian black-necked stilt (Himantopus mexicanus knudsenii). The wood they choose for this game was ʻohe makai. The fruits were used medicinally for babies. The mother would eat the fruits feed her baby through breast milk to cure pāʻaoʻao (childhood disease, with physical weaknesses) and ʻea (thrush) with no side effects.